Sukigirl made a very cute covered tape measure using stuff she got at the dollar store. I love covered measuring tapes – such a great canvas for creative crafting. You can put just about any motif you can imagine on a cover for a measuring tape! 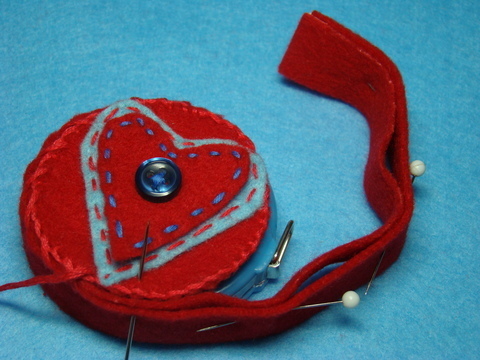 This one uses a rustic heart and button. So cute! If you have felted sweater scraps on hand, you can use them for this project as well! Thanks so much for including my little measuring tape. I love the fact that you have a blog based on dollar store crafts, brilliant!